Arms sales should not Trump human rights! 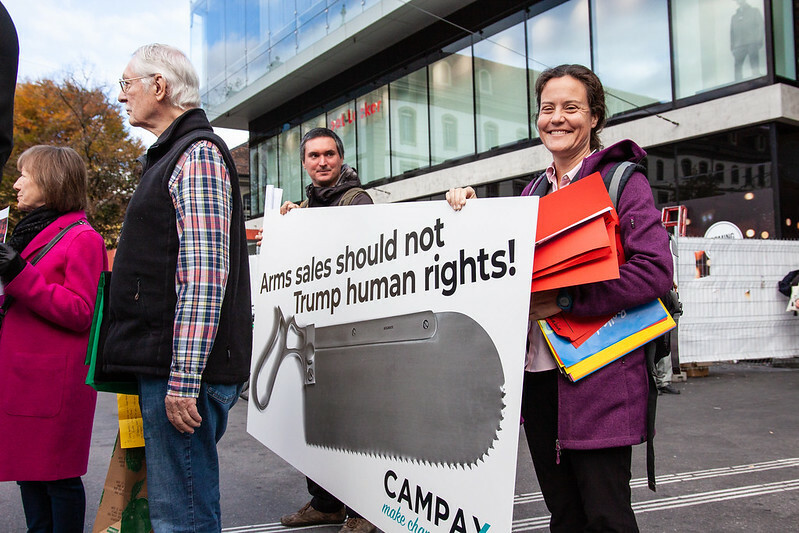 This morning, activists demanded an immediate arms export moratorium for Saudi Arabia with a spontaneous protest in front of the US embassy and on Bundesplatz in Bern. In response to the assassination of Jamal Khashoggi at the Saudi consulate in Istanbul, Campax activist has gotten a great deal of attention for our issue with signs depicting two huge bone saws in front of the U.S. Embassy and the Bundeshaus: We demand an immediate moratorium on arms exports for Saudi Arabia! The murder of Khashoggi has once again cruelly reminded us that arms exports to Saudi Arabia are absolutely unacceptable. The human rights situation in the Saudi kingdom and the war in Yemen must not be exacerbated by Swiss Weapons​. In the first nine months of the year, 2.4 million Swiss francs of arms were exported from Switzerland to Saudi Arabia. This is about 1% of Switzerland's total arms exports. The spontaneous protest was granted for only 7 people. A visit to the Saudi embassy was prohibited by the authorities for security reasons.